When water features are part of your landscaping, it brings a sense of relaxation along with many other benefits. Any landscape is improved and beautified when water is cleverly incorporated. The ponds don’t have to be large, even if you have a small yard, you can still enjoy the benefits of a pond. Water features are good for the environment, as they can provide many services. Perhaps most important is the home that your water pond will provide to all sorts of wildlife. Your entire family will enjoy watching the many species of birds that will come to visit including turtles and frogs that it may attract. 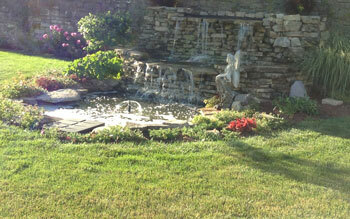 Water features are popular, and easy to maintain if done correctly, making them a plus when you go to sell your home. Attractive, relaxing, and beneficial, they are sure to please most potential buyers. Ponds of any size can have a fountain or waterfall. Either way, the pond will create its own level of noise, a background noise that can help drown out other noises around your home. Whether you are hoping to drown out road noise, or noisy kids, adding water can provide you with the static background noise that will work quite nicely. Your guests will also find your parties to be more entertaining when they have a water feature to enjoy. Your back yard can be transformed from a simple plot of land into a private oasis. Pond Lighting can take water ponds from a daytime feature to one that can be enjoyed twenty-four hours a day, and adding colored lights can turn your home into a truly magical place.